Dr. Joseph Hitt, Executive Director of the Wearable Robotics Association presented at the 2nd Annual Technology and Development Day hosted by Ekso Bionics. 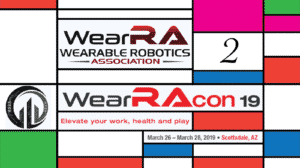 You might be familiar with the Wearable Robotics Association (WearRA) from the first ever Wearable Robotics Convention that they are organizing in February 2016. 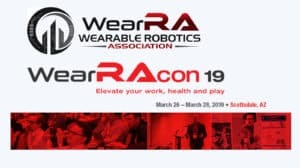 WearRA doesn’t just put together conventions and trade shows, but actively engages the global community in dialog about exoskeletons. First, developed countries have an aging population. The ratio of people in the workforce compared to those who are retired is being skewed in favor of the retired. Japan and Bulgaria are two of the countries that are leading this trend. As the population ages, each working person has to support a larger and larger fraction of the elderly. As a result, more people try to stay active in the workforce past their retirement age. While they may have a strong resolve to work, they could benefit from wearable robotics equipment that strengthens their bodies. Second, we live in a world of changing expectations. More and more people who are active in their work and communities now expect to remain active past their retirement age. Many elderly might not work full time jobs, but remain as consultants to their previous companies. My grandmother for example, refused to accept retirement and worked at a private clinic with fewer hours for many more years. These days she still stays active by taking the kids to school, cooking and even attending school herself. But she constantly complains that she just can’t move like she did when she was younger, especially when it comes to climbing stairs. The Wearable Robotics Association identifies people like my grandmother as strong potential customers for exoskeletons. Finally, WearRA believes that we have reached a “Hardware Threshold.” When personal computers became more readily available, more people had the chance to learn software programing. As a result, East Europe and India became software powerhouses, cranking out product and software engineers alike. Dr. Hitt believes that the cost of robotics hardware has become low enough that anyone interested in robotics can start building their own prototypes. I am personally putting this theory to the test, last week I purchased an Intel controller with a board and I just need to get a power supply. Including a laptop and motors the total cost to start with robotics is still about $500 which is high, but not as bad as using industrial components. In comparison, a single motor precision controller for the semi conductor industry costs $700 each. 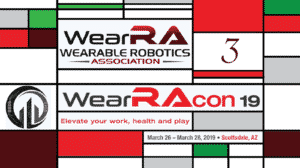 While the folks at the Wearable Robotics Association have been busy preparing for the WearRAcon16 they still managed to do a bit of traveling. WearRA staff has circled the world and met with over 50 manufacturers and potential users of exoskeleton products. They noticed that the EU and Asia are much more organized, and have an easier time securing government funding and passing regulations. The US in comparison is starting to lag behind with the exception of the media. US movies and computer games are featuring exoskeletons more heavily than ever, making them more culturally visible. There is also a difference in how research is being conducted. In S. Korea and Japan a lot of the large companies and conglomerates are driving wearable robotics research and innovation in a top down approach. In contrast, US and EU exoskeleton companies tend to grow out of research universities. Companies are starting to become aware of this technology and would like to know if they can use it, how much it will cost and whether it will help them? In industry, there is a great interest in back, ankle and knee joint injury which total billions of dollars in worker related medical costs in the US every year. WearRA is on the fore front of linking the global community. They are also helping to start standardizing exoskeletons, and ISO and IEEE standards are in the works. Some of the older exoskeleton companies have started expanding their product portfolio to go into multiple areas at the same time. Dr. Joseph Hitt highlighted CYBERDYNE which started as an Assistive/Elderly company but is now making a lift assist device for industrial use that can be leased in Japan. The company’s products are well received in Japan and it is now the first billion dollar exoskeleton company. Dr. Hitt also highlighted RB3D for having recently signed multiple contracts (which is great news since at one point it seemed like they are giving up on their exoskeleton production). He also mentioned Google and Boston Dynamics which aligns with rumors that the internet giant is considering making a wearable robotics device. WearRA expects that we are about 5 years away from a large explosion in exoskeleton proliferation. They identify that the most exciting fields with biggest growth opportunities are the Manufacturing/Construction and recreational exoskeletons. Governments will help with more reimbursements to cover the costs of exoskeletons with more evidence that there is cost saving in using them. They also have to become less expensive. For the time being, it makes sense to have them in a clinic where the same unit can be used on multiple users. 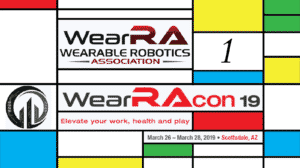 If you haven’t already, take time to explore the Wearable Robotics Association website but note that you need to be a member to unlock all of the pages like their wiki and forum. Also it’s not too late to sign up for the WearRAcon16 happening Feb 10-12, 2016. Dr. Joseph Hitt has a PhD in Mechanical Engineering from Arizona State University. He worked as a systems program manager at DARPA where he most likely was exposed to exoskeletons during the HULC project. He is currently the CEO of GO XTUDIO, LLC, a product development company focused on wearable and robotic technologies and Chief Operating Officer, Fitt Scientific. He is also the Executive Director of the Wearable Robotics Association.